Last edited by Pete; 02-07-2011 at 02:26 PM. The iconic clock at First National Tower is lit and working again after being a years-long symbol of the landmark's slow demise. Owners Aaron and Raymond Yashouafar estimate they've spent more than $1 million on renovations since buying the property last year — with the clock being the most visible improvement. "Restoring the clocks to their working order is the first step in letting the public know about our commitment to bring the First National Center back to life,” said Aaron Yashouafar, chief executive of Los Angeles-based Milbank Real Estate. The clock first began informing passersby of the time when the tower opened in 1931. But for more than a decade, it stood frozen and dark. Ken Crume, the contractor who restored the clock, said it prompted many a memory as he visited with curious downtowners. Other small touches: the ornate water fountain in the lobby of the original tower is working again after being reduced to a small drip the past decade. Responding to complaints voiced against previous owners, the Yashouafars also hired 24-hour security, and boast of full-time cleaning crews. They say their response time to any tenant's call is 24 hours or less. The Yashouafars say they've discovered the costs of bringing the complex back to Class A office space are higher than the $6 million they cited in September. But they remain committed to the overhaul, and will soon unveil a master plan drawn up by Beck and Associates. Beyond restoring the clock, the company recently spent $600,000 installing a fire, life and safety system equipped with voice activation and strobes that comply with the Americans with Disabilities Act. Also new to First National: a hook-up to Trigen for heating and cooling, replacing an old building central plant that was plagued with break-downs. The owners also have spent much of the past few months gutting and cleaning the east tower, mostly empty for almost 20 years. The work includes asbestos removal and stripping out improvements dating back to the 1970s. The building will feature floor plates of 55,000 to 70,000 square feet, the sort of large continuous spaces being sought by today's tenants. I've always loved this building. I hate the crap they added on the side of it since it is so mismatched, but I love the tower. I really do wish something would happen i the hall though. That's such a magnificent space and it's such a shame it just sits there right now. The Hall is singlehandedly the MOST BEAUTIFUL and ornate space in all of Oklahoma City. At the very least they should polish it up a bit and lease the space for weddings. Karried, your attempt to resize the photo I posted didn't work, it's still ginormous. Is the Beacon Club still on the top floor? No, the Beacon Club moved to the Oklahoma Tower when that opened, I presume. Wonder what'll be at the top. I think an observation deck would be great for OKC. It would be really cool if they'd dedicate an entire floor and have it open to the elements (with safety features so nobody can jump. It would be cool, but that's extreme prime time space that they'd lose. I'd imagine that they would be charging for it....then that's an awful lot more traffic on those elevators that go that far up. They moved to OK tower but the move was in 1994 I believe, not when OK Tower opened (which was 1984). They moved because the then owners refused to invest into the building. The Beacon Club reviewed their options and thought it would be a waste for the club to further renovate their space on the top 3 floors (30, 31, 32) or move to another downtown tower. They chose the latter, selecting the 24th floor of the 30-storey Oklahoma Tower. I believe their lease might be running out in the next 5 years. Hopefully, with the new owners of FNC investing into it - the club and the owners can work things out. I think the club BELONGS in the FNC - that is where the BEACON is, where the club gets its name. I think the Beacon Club compliments the city's other top private club - the Petroleum Club attop Chase Tower (Floors 34, 35, 36). I hope once/if the Beacon Club returns to FNC - that a new upscale restaurant open to the public (opposed to private club) will take over the 24th floor space in Oklahoma Tower. 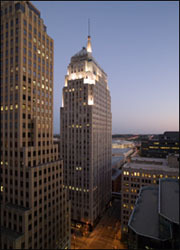 The more high end restaurants in downtown's CBD the better for Oklahoma City and our image!!!! That's a lot of information. Thanks. I played at the Beacon Club in the 80's. It had a terrific view. I didn't know it had moved to the Oklahoma Tower. The Petroleum Club has a great view. You're welcome....it's a lot smaller than it was... anyway, when you Save As a jpeg go to Microsoft Photo Editor or whatever program you use to edit photos and click Resize ..change the numbers in the boxes to resize the photo and then Save ... you can play around with it to get the size You want.
" You've Been Thunder Struck ! " I belonged to the Beacon Club when it was atop FNC in the 80's. Always loved it there, as it was smaller and more friendly than the Petroleum Club. I wonder if the new location still makes that great Monte Cristo sandwich? I think they do, check out their web site. Also, I think you can go up to eat without being a member also, sort of like a preview. Wait, what about that big clock that people could see from the highway? Help me out here. Do you mean the one that was on the top of the bank in the 70's? If so, it gave the time and temperature. I don't know when it went up or came down. Wasn't the huge time/temp display on top of City Place, formerly the City National Building? I don't think there was ever one on top of FNC. Ack! Now I don't know. I remember looking out of the window from N.W. 12th & Hudson to see the time and temp. I always thought it was on the 1st Nat'l band. I'm pretty sure it was the City building because I remember "City" being spelled out on the display in script. You are correct! 1stNB used to have time and temp over the phone. That may be where I got the idea. Now I know how they put it on top of 1stNB. They didn't.